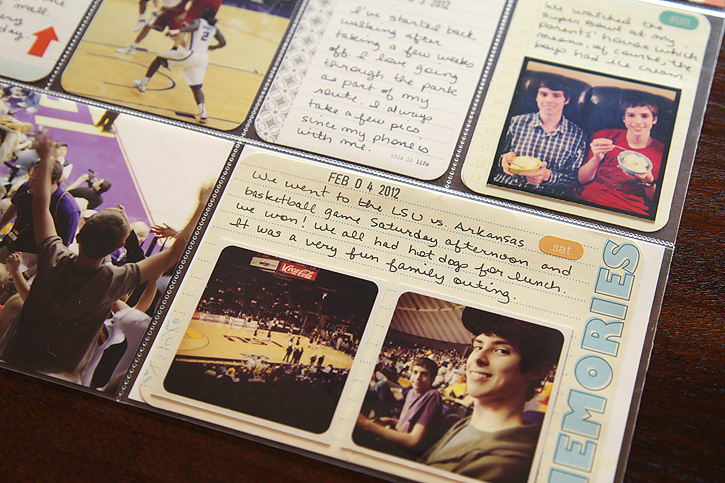 As I'm looking over my week five layout I'm realizing the only dslr pictures are the 4x6 and the 3x4 from the LSU basketball game. All of the others were taken with my iphone and edited with instagram. I used cardstock from the clementine collection to back the 4x4 photos and the double sized journal cards for the days where I shared two smaller instagram pics. I love all the little details that project life documents for me... like my new festive mouse pad. It came from Marci Ann Designs on Etsy. She has lots of cute patterns available if you're needing a new one. I also documented a trip to the apple store. This is totally off topic, but here's the deal. Since we all four have iphones and we all use separate apple ids, I went to find out how we can share music on the rare occasion that we both like the same song (i.e. Adele). I mean, we shouldn't all have to pay for the same song, right? I was told that it was fine for my boys to sign into my account and vice versa so we can share apps and music. I asked to make sure, and was told we aren't breaking any rules by doing this. It doesn't seem to be working. Mason's phone told him he can't sign back into his account to download prior purchases for 90 days. It's all very confusing. Here are a couple of detail shots. I'm liking the relaxed approach of documenting an overview of our week as opposed to making sure I have a photo from each day. This way, I can take up a few more spaces when I have more to share from one day, like going to the basketball game. I was able to include a pic of the boys, an overall pic of the court, a close up of some action and my favorite... Mike the Tiger! 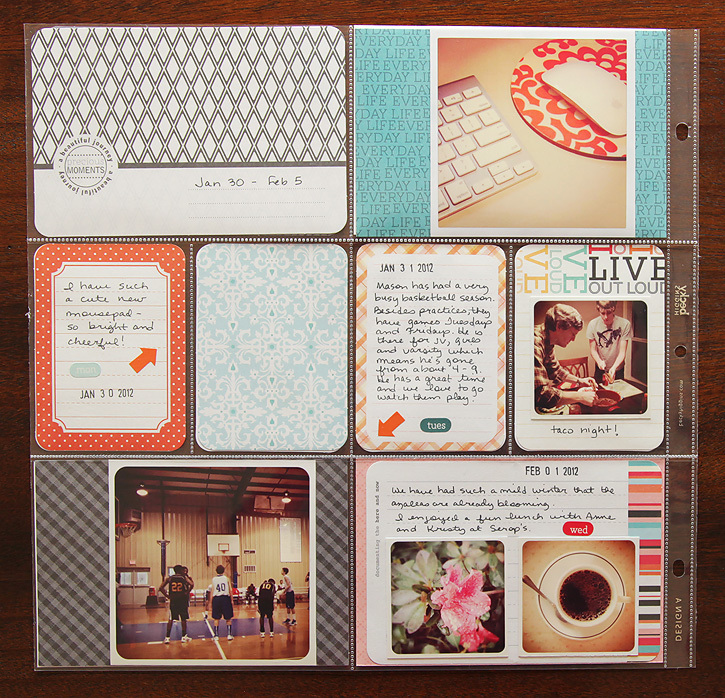 Check out lots more project life sharing at The Mom Creative. What a great week! Love how you're doing the layouts. I am a bit afraid to get creative with what I am doing for fear I won't like it! I tried some stickers last night and the jury is still out if I will keep them! 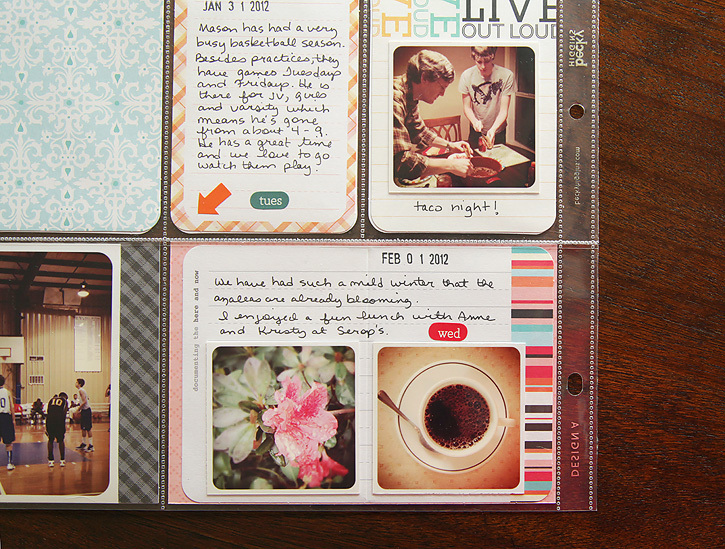 I still LOVE this scrapbooking style way-way-way too much! Also, way to be proactive about doing something more with the pictures taken on your phone. These are terrific -- I love your layouts. I completely adore your clean style and the use of the Clementine Core Kit - just amazing!! TFS! Looks great Deb! I need to take an above shot of my morning tea like you did of your coffee. Thanks for sharing! Your album is looking amazing Deb, very inspiring. I am a huge fan of your photography and so enjoy visiting your blog! You're doing so well with this! I really admire how you stick with it! Oh! I love your layouts. Looks great. eeek I love the streamlinieness (not a word I know) but it looks so good! And the instagram shots...so jealous, they come out looking WAY better then my Droid-not-a-gram shots ;) Happy Project Life! Love your pages! And really love that mousepad...wherever did you find it?! Love your mouse pad. Thinking I need to pick up a new one. Loving your new wallpaper here too :) Hope you are having a great week my friend! Your mouse pad is way cute. Love the cardstock behind the pictures. It looks great! 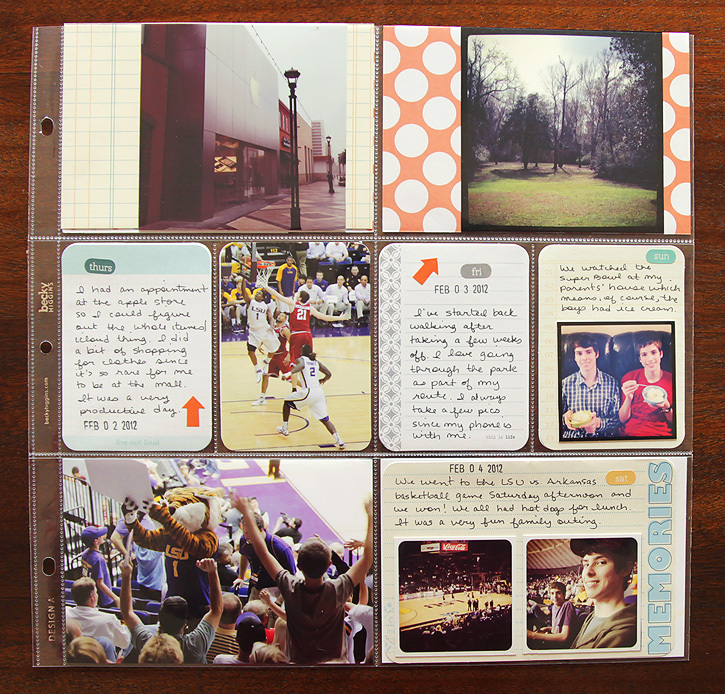 Like the color on your pages and love your basketball shots. I'm still working on mine--it's not easy. WOW!! 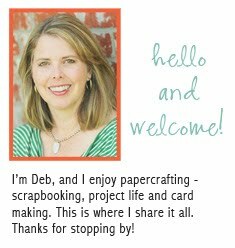 I really enjoy your pages- looks like a great week- I really love how you capture so many amazing life details..I need to work on that more. Love the great things you include has well...wonderful job! 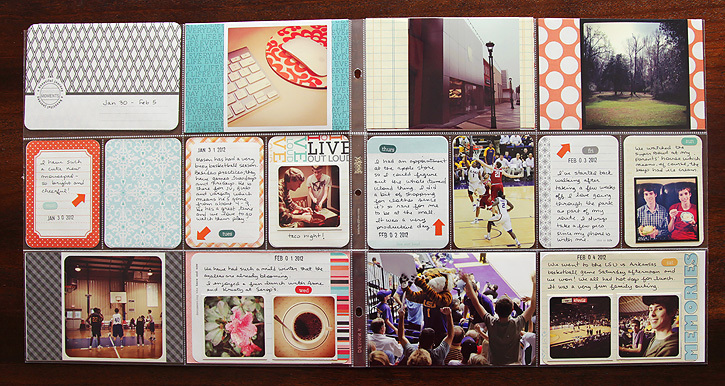 I like how to put two smaller instagrams on one larger journalling card. I might try that for the next few pictures I use. Those basketball photos are fab! I love seeing what others do so I can get news ideas....like doing 4x4 cards. Totally doing those for my week 9!! Ph my, I am so far behind with scrapbooking. I was doing great til I starte blogging. :( I have to get with it. You did some great work here! I really love seeing your Project Life posts. You do a really good job of keeping up with it. I must look into experimenting with instagram it seems like fun. Nice reminder to use the PL stickers. Looks great! Your posts are always great and I love how you capture everything about your daily life in a few great photos!